W.W. Norton & Company, New York, 2003 First Edition, First Printing with the number line beginning with 1. This copy is SIGNED and dated on the year of publication by Michael Lewis. This First Issue dustjacket is rich in color and has the publisher's printed price present on the front flap. The book is in great shape. The binding is tight with minor wear to the edges. The pages are clean with NO marks or bookplates in the book. A wonderful copy SIGNED by the author.. Signed by Author(s). 1st Edition. Hardcover. Fine/Fine. W.W. Norton & Company, New York, 2003 First Edition, First Printing SIGNED by Michael Lewis on the title page. A spectacular copy. This ORIGINAL dustjacket is vibrant in color with NO chips or tears. The book is in excellent condition and appears UNREAD. The binding is tight with NO cocking or leaning and the boards are crisp. The pages are exceptionally clean with NO marks or bookplates in the book. A superb copy SIGNED by the author.. Signed by Author(s). 1st Edition. Hardcover. Fine/Fine. Thorndike Press, 2003-12-15. 1. Hardcover. Used:Good. 2003-09-04. Good. Ships with Tracking Number! INTERNATIONAL WORLDWIDE Shipping available. May not contain Access Codes or Supplements. May be ex-library. Shipping & Handling by region. Buy with confidence, excellent customer service! 2004-02-02. New. Ships with Tracking Number! INTERNATIONAL WORLDWIDE Shipping available. Buy with confidence, excellent customer service! 2018-10-01. Good. Ships with Tracking Number! INTERNATIONAL WORLDWIDE Shipping available. May not contain Access Codes or Supplements. May be ex-library. Shipping & Handling by region. Buy with confidence, excellent customer service! 2004-06-03. New. Ships with Tracking Number! INTERNATIONAL WORLDWIDE Shipping available. Buy with confidence, excellent customer service! W. W. Norton & Company. Used - Very Good. Very Good condition. Stamped on dedication page. 2008-10-20. New. Ships with Tracking Number! INTERNATIONAL WORLDWIDE Shipping available. Buy with confidence, excellent customer service! W. W. Norton & Company, 2003. Later . Hardcover. Near Fine/Near Fine. SIGNED BY BILLY BEANE. I got them signed at Spring Traing, looks like BB. Photos if requested. Now a movie starring Brad Pitt. The classic of the Oakland A's, the revolution in baseball, and the story of it's architect based in Sabermetrics. I have 1000+ baseball books for sale. To see a complete list send me an email request. W. W. Norton & Company, 2003. Large, sturdy book, red spine, gray boards, silver lettering bright on spine, 288 pages. DJ glossy with man holding a hardball on front, title in red, photo of Lewis on all of back. DJ and book, both As New.. First Edition. Hard Cover. As New/As New. 2003-01-04. Good. Ships with Tracking Number! INTERNATIONAL WORLDWIDE Shipping available. May not contain Access Codes or Supplements. May be ex-library. Shipping & Handling by region. Buy with confidence, excellent customer service! W. W. Norton, 2003. (1st edition, 1st printing) Large, heavy book, red spine gray boards, bright silver lettering on spine, 288 pages. 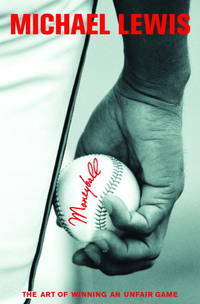 DJ glossy, a photo of hand holding baseball in color on front, white spine, raised title and author, photo of Lewis on all of back. DJ has very tiny scratch at top back tip. Near Very Fine DJ/Very Fine book.. First Edition. Hard Cover. Fine/Near Very Fine. New York: W. W. Norton & Company, 2003. 1st Edition. Hardcover. Fine/Fine. 8vo., xv, 288 pp., red and gray paper over boards with photo-illustrated dj. A fine copy in fine dj. The secret of success in baseball, and how to put a price on it. Moneyball: The Art of Winning an Unfair Game. New York: Norton, 2003. Very good condition with only minor signs of external wear. . New York, Norton, 2003. Octavo. XV, 288 pages. Original Hardcover with original dustjacket in protective collector's mylar. Very good condition with only minor signs of external wear. Michael Monroe Lewis (born October 15, 1960) is an American non-fiction author and financial journalist. His bestselling books include Liar's Poker (1989), The New New Thing (2000), Moneyball: The Art of Winning an Unfair Game (2003), The Blind Side: Evolution of a Game (2006), Panic (2008), Home Game: An Accidental Guide to Fatherhood (2009), The Big Short: Inside the Doomsday Machine (2010), and Boomerang: Travels in the New Third World (2011). He has also been a contributing editor to Vanity Fair since 2009. His most recent book, Flash Boys, which looked at the high-frequency trading sector of Wall Street, was released in 2014. Lewis described his experiences at Salomon and the evolution of the mortgage-backed bond in Liar's Poker (1989). In The New New Thing (1999), he investigated the then-booming Silicon Valley and discussed obsession with innovation. Four years later, Lewis wrote Moneyball, in which he investigated the success of Billy Beane and the Oakland A's. In August 2007, he wrote an article about catastrophe bonds entitled "In Nature's Casino" that appeared in The New York Times Magazine. In a 2011 column in The Atlantic, American journalist and sports author Allen Barra takes issue with Lewis's characterization of Major League Baseball in his 2003 book Moneyball. Barra writes: "From a historical standpoint, Lewis is, well, way off base. By the end of the 20th century baseball had achieved a greater level of competitive balance than at any time in the game's history... Moneyball doesn't just get the state of present-day baseball wrong; it also misrepresents the history of the sport." (Wikipedia). Condition: Very good condition with only minor signs of external wear. W. W. Norton. LIBRARY BINDING. 1439566208 New Condition. . New. W. W. Norton & Company. PAPERBACK. 0393324818 New Condition. . New. W. W. Norton & Company. PAPERBACK. 0393338398 New Condition. . New. 2004-02-02. Good. Ships with Tracking Number! INTERNATIONAL WORLDWIDE Shipping available. May not contain Access Codes or Supplements. May be ex-library. Shipping & Handling by region. Buy with confidence, excellent customer service! W W NORTON AND COMPANY. PAPERBACK. New . New Book. Shipped via DHL/FEDEX with tracking ID. 2011-05-05. Good. Ships with Tracking Number! INTERNATIONAL WORLDWIDE Shipping available. May not contain Access Codes or Supplements. May be ex-library. Shipping & Handling by region. Buy with confidence, excellent customer service! 2008-10-20. Good. Ships with Tracking Number! INTERNATIONAL WORLDWIDE Shipping available. May not contain Access Codes or Supplements. May be ex-library. Shipping & Handling by region. Buy with confidence, excellent customer service! W.W. Norton and Co., 2003 First edition, as stated on copyright page; first printing as indicated by number line 1 2 3 4 5 6 7 8 9 0.. 1st Edition. Hardcover. Fine/Fine. W. W. Norton & Company. PAPERBACK. 0393338398 Has heavy shelf wear, but still a good reading copy. A portion of your purchase of this book will be donated to non-profit organizations. Over 1,000,000 satisfied customers since 1997! We ship daily M-F. Choose expedited shipping (if available) for much faster delivery. Delivery confirmation on all US orders. . Good. Thorndike Press, 2003-12-15. Hardcover. Good. W. W. Norton & Company, 2004-07-13. W. W. Norton & Company. Hardcover. 0393057658 New Condition *** Right Off the Shelf | Ships within 2 Business Days ~~~ Customer Service Is Our Top Priority! - Thank you for LOOKING :-) . New. W. W. Norton & Company. PAPERBACK. 0393324818 . New. 2014. 2004-06-03. Good. Ships with Tracking Number! INTERNATIONAL WORLDWIDE Shipping available. May not contain Access Codes or Supplements. May be ex-library. Shipping & Handling by region. Buy with confidence, excellent customer service! 2011-07-05. Good. Ships with Tracking Number! INTERNATIONAL WORLDWIDE Shipping available. May not contain Access Codes or Supplements. May be ex-library. Shipping & Handling by region. Buy with confidence, excellent customer service! NORTON. New. 8.46 x 6.76 cm. W. W. Norton & Company, 2011-08-22. Paperback. Used:Good. Intrínseca, 2014. Paperback. Very Good. Disclaimer:A copy that has been read, but remains in excellent condition. Pages are intact and are not marred by notes or highlighting, but may contain a neat previous owner name. The spine remains undamaged. At ThriftBooks, our motto is: Read More, Spend Less.Dust jacket quality is not guaranteed. W. W. Norton & Company. PAPERBACK. 0393324818 Like New Condition. . Fine. W. W. Norton. LIBRARY BINDING. 1439566208 Like New Condition. . Fine. W. W. Norton & Company. PAPERBACK. 0393338398 Like New Condition. . Fine. W. W. Norton & Company. Hardcover. 0393057658 Brand New ,Original Book , Direct from Source , Express 5-8 Business days worldwide Delivery. . New. Book and dust jacket are in fine condition. The image provided is the actual book I'm offering for sale. No markings or damage to any pages. No sunning. No clips. Structure of the book (covers, binding, spine, hinges) is tight and free of damage. Page block is nice and square. Cut pages. Additional photos will be provided upon request in order to ensure the quality and integrity of your book purchase. Thorndike Press. Used - Good. Former Library book. Shows some signs of wear, and may have some markings on the inside. W. W. Norton & Company. PAPERBACK. 0393324818 . New. 2017. Thorndike Press, 2003. Hardcover. Acceptable. Disclaimer:A readable copy. All pages are intact, and the cover is intact. Pages can include considerable notes-in pen or highlighter-but the notes cannot obscure the text. At ThriftBooks, our motto is: Read More, Spend Less.Dust jacket quality is not guaranteed. W. W. Norton & Company. New in New dust jacket. 2003. First Edition; First Printing. Hardcover. 0393057658 . Book and DJ New. DJ not price clipped ($24.95) . No names, notes, or ANY markings. NOT remaindered. ; Yes, 1st printing. ; 288 pages .